Reduces internal damage of radio caused by connector movement. Locks in consistent communication with wiggle-free contact. 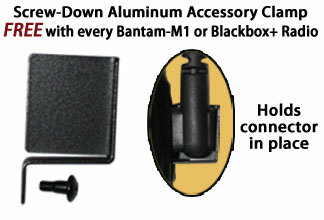 Used for Blackbox™ Bantam® radio with a Motorola connector (Bantam-UHF-M1 or Bantam-VHF-M1 only) or any Blackbox™+ radio.